Recover PST Deleted Items: Emails, Contacts, Calendar, Tasks, etc. 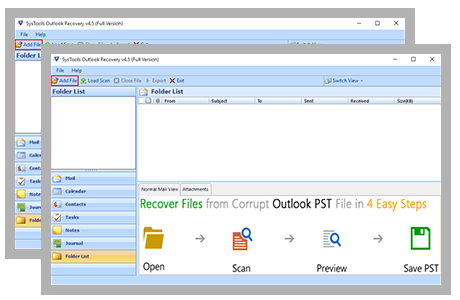 Outlook Recovery Software: Recover Data From Corrupt PST File. A large number of users around the world use MS Outlook emailing service! Reason being, it is cost-effective, simple to operate and is engaged in emailing and related processes. The mailbox repository of Outlook is PST file. There can be one or multiple PST files in Outlook but the unfortunate part is these files can get corrupted calling for PST file recovery need. The two types of PST files, ANSI and Unicode both can get corrupted due to variety of reasons. To repair damaged PST file and recover data from it, we offer the most qualitative solution namely Outlook Recovery software. The specialization of this tool is, it helps in retrieval of emails, contacts, tasks, calendars and other mailbox items. Recover Outlook PST File Delete Items: Emails, Contacts, Etc. Outlook Recovery tool is created to repair Outlook Inbox with its associated properties of Outlook Files accidentally damaged or lost. The PST Files comprises of emails with the attachments, address books, journals, calendars, notes, tasks and many more. All these data can be recuperated via tool. The Outlook data recovery software provides users with option to reduce an oversized PST files while encountering corruption. The oversized PST files leads to multiple issues like PST data loss and it gets difficult to come over these issues and the most complicated task is to recover PST files in case any issue encountered. Once you have completed the scanning process, Outlook file recovery software would help in analyzing, viewing and recovering Outlook mails and associated attachments available on software panel. At last, choose an email and get display of the attachment files by incorporating Attachment View Alternative. It is claimed as brilliant software to recover PST files into many file formats like PST / MSG / HTML / PDF / EML and Office 365. The users can both choose selective emails and then hit on export button present on top menu bar of Outlook file recovery tool to restore Outlook Items and store data into a new PST file. For analyzing and recovering PST files, Outlook Recovery application serves with an Advance Mode Feature. The program has a marvelous interface that leads to recover PST data files from basic stretch. If you ought to repair highly corrupted PST files / BAK files, the usage of this program seems a brilliant idea. Outlook PST file recovery tool offers the users in making final report that entertains users with the complete overview of entire execution and logs once the application accomplishes its task. All the data is finally saved into CSV format and can be viewed by hitting OK button. It makes fetching the data process easier. Outlook BAK Restore Tool helps users to repair Outlook pST / BAK file and provides a final report that convince the users with the complete overview of entire execution and logs once the application accomplishes its task. All the data is finally saved into CSV format and can be viewed by hitting OK button. It makes fetching the data process easier. Outlook Recovery Software provides the users with two different types of views i.e., Horizontal and vertical view. These views can be used to preview the emails in different manner. Among all the options, you can choose any of the display modes like Horizontal or Vertical view and finally use switch view option and opt for required one. Despite of all the features, it provides the users with naming convention option for storing mails. The best thing about this program is its compatibility with all Operating Systems (Windows 10, 8, 8.1. 7, XP, etc.) . To ensure that our users are satisfied with the product before investment, we provide its free demo version. With trial version, user can have view over software features and working but cannot save the PST recovery resultant. If software performance in free testing version has been satisfactory, then for saving recovered Outlook file, investment in licensed version of tool is necessary. 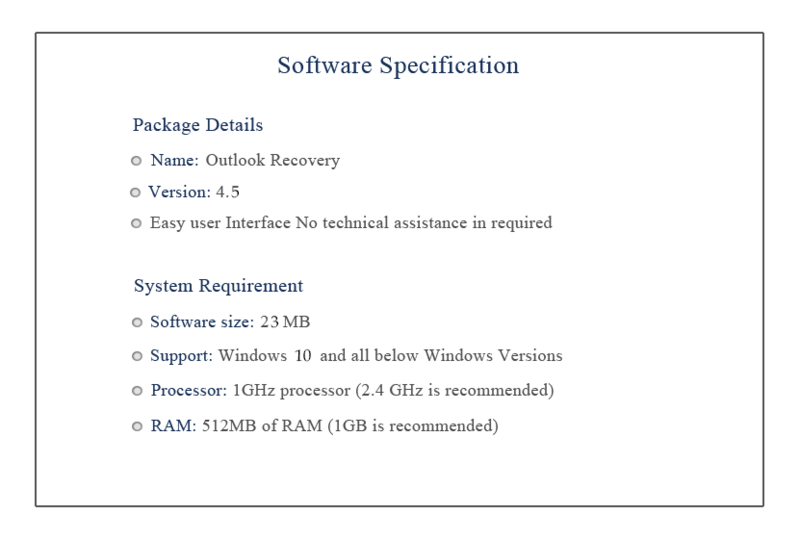 The complete version of recovery software is available in three different licenses in accordance to the need to use solution on number of machines. Does the Outloook PST File Recovery Software easily retrieve deleted Outlook Emails? Yes, using Outlook Recovery tool, users can recover deleted items from Outlook 2016, 2013, 2010, 2007, 2003, 2002 PST file within seconds. Can I recover data from Outlook BAK file while running ScanPSt.exe? Yes, The software provide option to add Outlook BAK file(s) in software interface using Select / Search BAK / PST file option. The tool will scan and load repaired and recovered data from BAK file in the preview panel. You can restore Outlook BAK file data efficiently without any data loss. Does PST File Recovery Tool helps users in scanning unhealthy PST files? Yes, our Outlook Data File Recovery Tool employee’s two methods to make the PST file in workable condition. The two methods are Quick and Advanced Scan. By employing any scanning methodology, you can recover damaged Outlook PST Files. Is there any provision to save the files when done with the recovery process for future purposes? Yes, the Outlook data recovery software allows the users saving the resultant PST files into CSV so that it can be used in future in time of crisis. Can the PST Recovery Software truncate damaged and oversized PST files? Yes, Outlook Recovery software provides users with split PST option to divide large sized PST Files easily. Which all format, I can save my PST / BAK data using this tool? You can save or export Outlook data items as PST, EML, PDF, MSG, HTML, or in directly import in Office 365 account. “While accessing the Outlook File Recovery tool, I was as relaxed as it served my purpose. The tool has some out of the box features. It performed all the functions with brilliant features like repairing corrupt PST files. Kudos Developers! for this brilliant tool”.